Your search for an economical' heavy duty detergent ended once you discover the ease and effectiveness of Oil Be Gone. 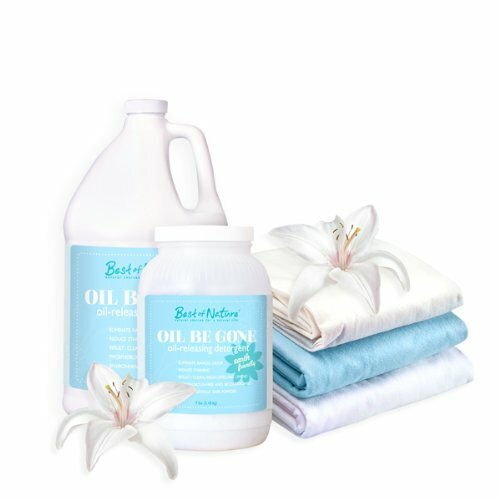 This detergent is specifically designed to pull oil from linens' reducing the buildup of rancidity and stains; added brighteners help make your laundry look even cleaner. Can be used in all temperature settings' but hot water opens the fibers more and works better for severe buildup. Since the difficulty with oil in sheets has to do with buildup that occurs over time' it may not be necessary to use Oil Be Gone every time you wash; try it every other load' alternating use with your regular detergent and the results remain the same! Available in Liquid or Powder. Oil Be Gone contains a non-ionic surfactant and does not "suds" as much as most detergents. If you have any questions about this product by Best of Nature, contact us by completing and submitting the form below. If you are looking for a specif part number, please include it with your message.